In October 2004, excavation of fragmentary skeletal remains from the island of Flores in Indonesia yielded what was called "the most important find in human evolution for 100 years." Its discoverers dubbed the find Homo floresiensis, a name suggesting a previously unknown species of human. "The skeletal sample from Liang Bua cave contains fragmentary remains of several individuals," Eckhardt said. "LB1 has the only skull and thigh bones in the entire sample." Initial descriptions of Homo floresiensis focused on LB1's unusual anatomical characteristics: a cranial volume reported as only 380 milliliters (23.2 cubic inches), suggesting a brain less than one third the size of an average modern human's and short thigh bones, which were used to reconstruct a creature standing 1.06 meters (about 3.5 feet tall). 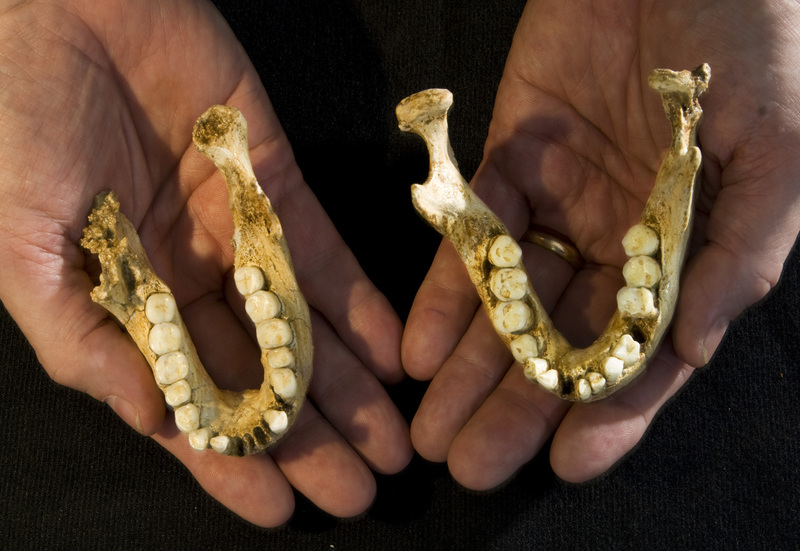 Although LB1 lived only 15,000 years ago, comparisons were made to earlier hominins, including Homo erectus and Australopithecus. Other traits were characterized as unique and therefore indicative of a new species. The original estimate of 3.5 feet for the creature's height was based on extrapolation combining the short thigh bone with a formula derived from an African pygmy population. But humans with Down syndrome also have diagnostically short thigh bones, Eckhardt said. "When we first saw these bones, several of us immediately spotted a developmental disturbance," said Eckhardt, "but we did not assign a specific diagnosis because the bones were so fragmentary. Over the years, several lines of evidence have converged on Down syndrome." The first indicator is craniofacial asymmetry, a left-right mismatch of the skull that is characteristic of this and other disorders. 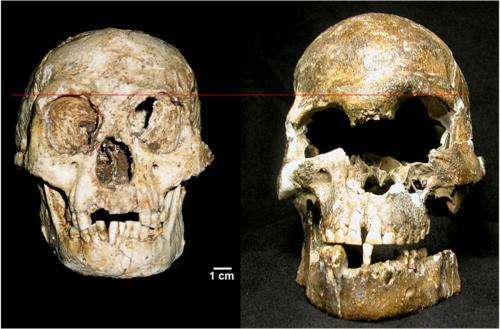 Eckhardt and colleagues noted this asymmetry in LB1 as early as 2006, but it had not been reported by the excavating team and was later dismissed as a result of the skull's being long buried, he said. A previously unpublished measurement of LB1's occipital-frontal circumference—the circumference of the skull taken roughly above the tops of the ears—allowed the researchers to compare LB1 to clinical data routinely collected on patients with developmental disorders. Here too, the brain size they estimate is within the range expected for an Australomelanesian human with Down syndrome. LB1's short thigh bones not only match the height reduction seen in Down syndrome, Eckhardt said, but when corrected statistically for normal growth, they would yield a stature of about 1.26 meters, or just over four feet, a figure matched by some humans now living on Flores and in surrounding regions. "This work is not presented in the form of a fanciful story, but to test a hypothesis: Are the skeletons from Liang Bua cave sufficiently unusual to require invention of a new human species?" Eckhardt said. "Our reanalysis shows that they are not. The less strained explanation is a developmental disorder. Here the signs point rather clearly to Down syndrome, which occurs in more than one per thousand human births around the world." This is ridiculous. First off, the Flores skeletons have been of old adults, in their 30s (old compared to the life expectancy back then). Now consider this: the average life expectancy of a person with Down syndrome was 12 years in the year 1912 (people with Down syndrome need medical care for problems with heart, gastrointestinal issues etc.). 13,000 years ago the life expectancy of a person with Down syndrome must have been a couple of years at most. Life was harsh back then. Not to mention that Down syndrome exists these days mostly because women come pregnant beyond their 30th birthday. People back then had babies when they were 15, not when they were 40. Every single "odd" morphological feature of hobbits distinguishes them from people with Down syndrome. Examples: People with Down have brains much larger than the ~400 cc of hobbits. People with Down don't have long arms. People with Down have chin. Other distinguishing features: clavicle, shoulder blade, carpal bones, toes etc. The whole idea of a tribe of people with Down syndrome in a prehistoric jungle is just beyond ridiculous. The people with Down syndrome would have needed constant care because of their learning difficulties and problems with motor function, yet normal people haven't been found among the hobbit remains. Instead, small tools suitable for small people have been found. Does that mean that the tribe of Down people had somehow magically avoided the mental retardation that comes with Down syndrome? Also, I think this would be the first time that prehistoric skeletal remains of people with Down syndrome were found. Certainly there never had lived tribes of Down Neanderthals or Down Cro-Magnons. Nothing to see here -- just the latest attempt by this team to deny the status of the Flores specimens. The paper doesn't say much they haven't said before. Nuts! And this specimen was supposedly one of those "missing links" that would have showed that humans have descended from species like monkeys. Now that link is gone! Well, evolution continues to show virtually none of many millions of missing links between species that are supposed to be there! I wonder why so many people still want to cling to this debunked theory. Floresiensis was never considered a missing link. The original describer mistakenly listed it as a new species of the hominid family. Mountains of evidence point to the truth of evolution despite your religious bias against that truth. You should posting on Ken Hamm's site, not here where science is respected. He doesn't have an article up on this latest paper yet. The link above will show all his articles on Floresiensis. Since the paper above is very new, I expect it will be a bit before he comments, but it should be interesting. He seems quite unbiased, looking at both sides of everything. And his previous articles are well worth the read. At this point I think the evidence remains equivocated. The biggest problem is lack of data; they have only one skull and no DNA. Well, evolution continues to show virtually none of many millions of missing links between species that are supposed to be there! "There are many fossils of human ancestors, and the differences between species are so gradual that it is not always clear where to draw the lines between them. " The topic lists over twenty examples of transitional fossils, i.e. "missing links." TalkOrigins is a very good site for debunking creationist claims. I highly recommend it. Enjoy. One complete skull + a jawbone from other and small remains from other individuals (5-6 individuals in all) which all point towards small sized and small skulled hominids with archaic traits living in Flores in prehistoric times. I would bet for a 1,000 USD that floresiensis is a true species, not just bunch of diseased individuals. The finding has been attempted to explain away numerous times, with speculations about medical conditions such as microcephaly, Laron syndrome and cretinism. These were bad hypotheses that did not fit the evidence at all and were later thoroughly debunked. This Down syndrome speculation belongs to the same list of bad hypotheses. But I guess that DNA evidence is needed to convince all the "skeptics" out there. To the people who keep downvoting my comments: care to explain the points where you disagree with me? Do you think those jawbones are of people with Down syndrome? I'll add that the LARGER of those two jawbones belongs to LB1, the individual whose whole skull has been found. The lost Kardashian clan -someone alert Kanye! What is your scientific explanation for the origin of species? Your very existence proves evolutionary theory in that you are the missing link between animals and fungi. Has a body but no brain. Interesting. To the idiot comments that is. Hi Da Schneib! I read your link. I could not find the claim debunked there. Sorry, that's a one-star rating for obfuscation. The technical name for "missing links" is "transitional fossils" and there are lots of them that aren't missing at all; the most important and well-known one is the hominids (i.e. humans and near-humans). I even quoted that one. Please don't make stuff up. You'll just get caught and look foolish. Your claim was "none." I produced twenty. Now stop lying for jebus. I agree with Rute. Layman here, but this is more obvious balderdash than usual. - The paper rejects the otherwise supported homogeneity of the unique samples. - LB1 asymmetry is acknowledged to be from deformation of a very fragile ("paper like") porous sample from a wet mud environment. - That Eckhardt, despite his -06 paper titled "Pygmoid Australomelanesian Homo sapiens skeletal remains from Liang Bua, Flores: Population affinities and pathological abnormalities", claims that he did not design "a [specific] diagnosis". The consensus will not move because yet another, and from the outlook much worse, hypothesis of pathology has been voiced. Every time there is a story about evolution you claim evolution is not possible, that it is a "dead theory". Again, how do you scientifically explain the origins of species? Without evolution you can't. Time for you to put up or STFU! I owe you an apology but have to explain my down votes. I found your first sentence off-putting and in the body of your comments a tone of expertise but without links or citations. I have to confess I didn't know as much as I thought I did. Had you included the link Torbjorn provided I would have read it and I would have given you five stars. Well, I accept your kind apology, and appreciate explaining your reasoning. What this article should have needed is some words from experts of the other (majority) side of the debate. I'm by no means an expert and there are undoubtedly errors in my messages as well as indications that I'm missing big parts of the picture. But I do have interest in evolutionary biology and have followed the news through the years as the hobbit story has unfolded and there are certainly very odd aspects related to it, such as the actions of Teuku Jacob and his supporters. I think that the most likely explanation that everyone should recognize by now, based on the findings, is that there was indeed a whole population of very small hominids with small skulls and archaic traits living on Flores. I just checked Wikipedia and it says the number of individuals whose incomplete skeletons have been found by now is nine. That should be enough to draw the conclusion that it was just not one diseased individual. Mummy must be so happy she left the baby at the hospital and brought home the turd. Pretty annoying that the article does not mention the long-standing opposition to the species by Henneberg; even wikipedia bothers to mention the defense made by the proponents of the hobbit theory, and sources it properly. Seems like phys could do the same. You know, that skull does look like the skull of someone who had Down Syndrome. The only way to know for sure, though, is to try to find intact nuclear DNA and look for a tripled chromosome. So far, it hasn't yielded useful DNA of any kind. Yeah, Rex, they tried to get some from a tooth but were unsuccessful. They're thinking maybe they let it get too hot from the drill and denatured it. "The debate over the origins of LB1 has been going on for about a decade now. Other researchers have posted several rebuttals to claims made by researchers working on the skeletal remains, 'When this one is refuted, and it will be, then they'll find something else,' said Dean Falk of Florida State University and the School for Advanced Research NBC News. 'It's good to have people who can be skeptical, but this is turning into a circus.'" Dr. Falk's comment seems to have been written as a nonce reaction to news reports about our group's interpretations of the Liang Bua Cave skeletal remains, because our view differs from hers. The Falkian approach as quoted insists that the findings of anyone who disagrees with the "new species" dogma will of course be refuted. This may happen, of course, because our group accepts that we are dealing with scientific inference rather than divine revelation, but there is a difference between reflexively attacking the authors of scientific papers, vs. assessing the substance of the findings that they have published. In this case Dr. Falk clearly has done the former, which although not surprising, is disappointing. Her insouciant preference for emotions over evidence is signaled by various subtle glosses: The phrase "rebuttals to claims made by researchers working on the skeletal remains" implies that members of our group have not worked with the original materials; our papers make it clear that we have, which Dr. Falk knows very well anyway. Saying that the continuing disagreement over interpretation of the bones "is turning into a circus" is a partially true but peculiarly distorted perspective, like that given by a funhouse mirror that turns one's perception upside down from reality. Yes, Virginia, there is a Flores circus. It rolled into view late in October of 2004 with the first two papers published by the group dominated by the Australians Peter Brown and Michael Morwood (sadly, Mike now is deceased; he was a complex, energetic, and interesting person, and is survived by a wife and daughter, both of whom I have met and like; I send them my condolences and wish them well). Back to the circus. As initially represented in contemporaneous and subsequent media reports, the parade was led by a sort of gender dysphoric Snow White being, accompanied by 7 + 6 other little people. The LB1 individual stereotypically is referred to as female but in the earliest reconstruction is depicted as rather hirsute facially, though with skin elsewhere sufficiently glabrous as not to mask prominent male external genitalia; holding the latest mode in magic wand/cudgels; and with a fetching giant dead rat as a combination fur stole/takeout lunch draped fashionably over the left shoulder. The circus menagerie trailing after what later came to be marketed as an "alien from earth" included elephants, great slithery voracious dragons, those giant rats that had managed to survive the hunt, and eventually even hominin-menacing storks. Leading from behind was the bandwagon. Aboard that vehicle were a great many people tricked out as scientists, some with formal academic credentials that had been left behind at the office or lab in the hurry to climb aboard. Not having access to the evidence or time to devote to analysis, most traded snatches of gossip and rumor, employing skills honed during the childhood game of "grapevine." [ http://karlshuker...oom.html ]. For a long time no "hobbit" height was too short in the minds of creative writers. Commenting in Science, Jared Diamond used words alone to lop about half a foot (15 centimeters or so) from the originally reported, exaggeratedly short, stature. For the last decade our group – and a few other groups that deserve mention (those associated with Albert Czarnetzki, Israel Hershkovits, Robert Martin, Ralph Holloway, Charles Oxnard and Peter Obendorf, Gary Richards, come to mind, and I apologize for those that I may have missed) – have been trying to turn the "Hobbit" circus into science. As we point out in one of our pair of recent papers in PNAS, the approach taken by Falk and her associates has been to attack one or another supposed flaw in each of the attempted diagnoses offered so far to explain what is abnormal about LB1, then to proclaim something on the order of (I paraphrase here) "See! The Hobbit did not suffer from [particular diagnosis], so is normal after all." This is illogical, and I do not know whether I would prefer that Dr. Falk does or does not realize that her reasoning is faulty. So far, however, this tactic at least has seemed to work on many science writers (though not all – John Noble Wilford is a notable exception, and there are a few others). Now we are confronting this tactic head on. The first of our recent papers, with the catchy title "Rare events in earth history include the LB1 human skeleton from Flores, Indonesia, as a developmental singularity, not a unique taxon," makes the point that whatever the specific diagnosis based on its symptoms, LB1 is abnormal. Being abnormal, it cannot be used as the type specimen for a new species. NB: In my original draft of "Dean Falk's Floes Circus" the estimated number of individuals was the equivalent of 7 +/- 6 (i.e. 7 + 6 with the plus sign underlined to signal "7 plus or minus 6" but the formatting for this site eliminated the underlining. That is a small technical matter, but the main point stands: Peter Brown, Mike Morwood, and their associates who have had control of the Liang Bua Cave bones for more than a decade never have described the methods that they have used to estimate the number of individuals whose remains have been found, and the numbers that they publish vary erratically from one publication to another. I have to ask, Robert: if their explanations of how they came up with the counts they did aren't in their papers, how did those papers pass peer review and get published? This seems to me to be a fundamental requirement in any scientific paper, and any competent reviewer would have to notice they didn't describe their methodology and ask them about it, at minimum, and reject the article if they don't get a good answer, or if they refuse to answer. I also have to point out that you are accusing not only them, but their reviewers, of scientific misconduct. This is a very serious charge, and I'd like to see a lot more justification for it. Read their papers. You will see that their method has never been described. What other justification do you need besides papers published in good scientific journals?. Peer review is what the name suggests - a review by "peers", normal human beings who are fallible. Otherwise absolutely everything published in peer-reviewed journals would be invariably true. Robert does not accuse anyone of scientific misconduct. He just states facts. What I object to are comments made in this discussion by people who admit they did not read our papers but pass judgment on our statements. This is an error of conduct, in short - misconduct. In a serious discussion one has to show first that one understood what the other side wrote and then critically take it apart. Rute is a classic example. We say in our papers that we consider all skeletal fragments outside of LB1 not to be in any way pathological.Yet he ridicules the idea of the whole population of Down Syndrome people. He ridicules himself. That generally can happen. You have to really slow down the drill to try to prevent that. Not all down syndrome skulls show identical morphology. There are variants. And, that 'hobbit' skull looks like one variant I have seen with my own eyes. Look at the facial structure from profile and also the eye sockets very closely. One jawbone I looked at also looks exactly like the lower jaw of a down syndrome child I knew some years back. But, as I wrote before, only a tripled chromosome can confirm. Also a chemical analysis cna sometimes show something relative.